We had been to Italy twice before finally making it to Milan, not because we didn’t want to explore it, but more because there are so many amazing places in Italy it’s hard to see them all, even on multiple trips. 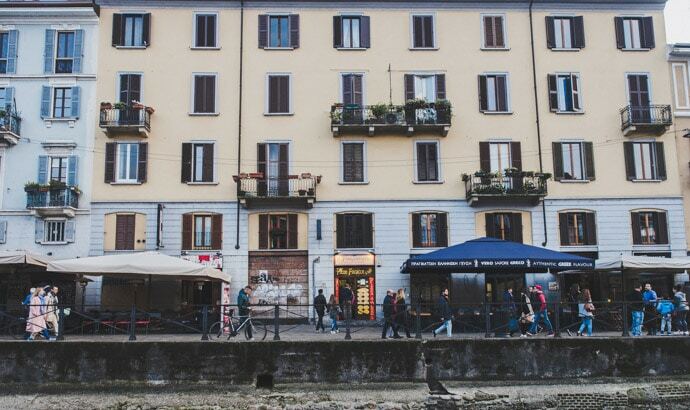 Milan has beautiful architecture, delicious traditional dishes and a refined personality. It’s that place where even 80-year-old men and women have such effortless style that it makes you rethink how you present yourself. 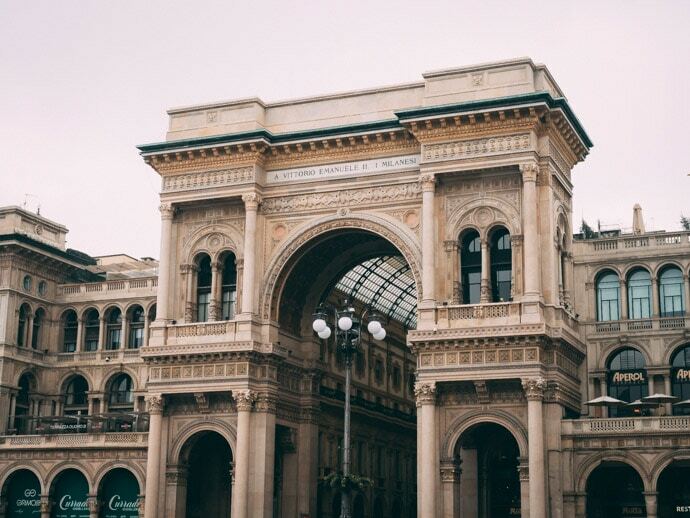 Here’s our guide to Milan so you can enjoy the best of Milan + printable guide to Milan at the end of this post. 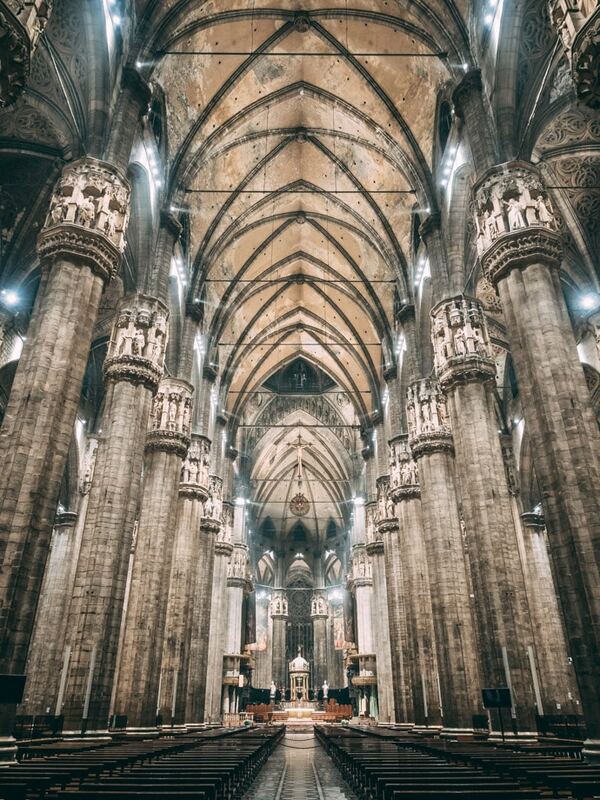 Perhaps the most iconic place in Milan is the Milan Duomo (Milan Cathedral). This absolutely stunning cathedral can have very long lines to get in, so be prepared. We went at the end of October, early November and the line at midday was so long we actually decided against seeing going inside (we estimated it would be at least 3 hours). That is, until we walked past again in the early evening, about 30 minutes before close, and we could buy tickets and enter with no line. It was perfect! The inside of the cathedral is beautiful. It makes you feel like you just want to be inside for that little bit longer to take it all in. 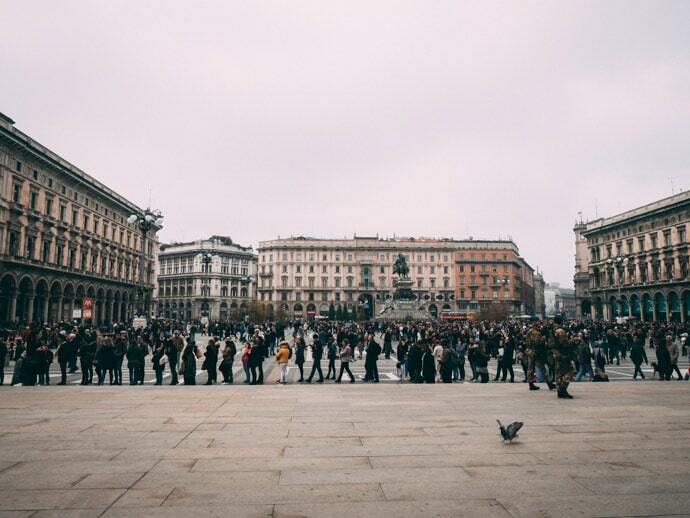 The fashion and shopping in Milan attract a lot of people to this city. There are so many amazing stores, from high end to small unique boutique shops. A unique venue is 10 Corso Como + Carla Sozzani gallery, which displays art, fashion, music and has a restaurant. One of our favourite shops in Milan is Eataly (multiple levels of Italian food deliciousness), even though it can be found in many Italian cities. 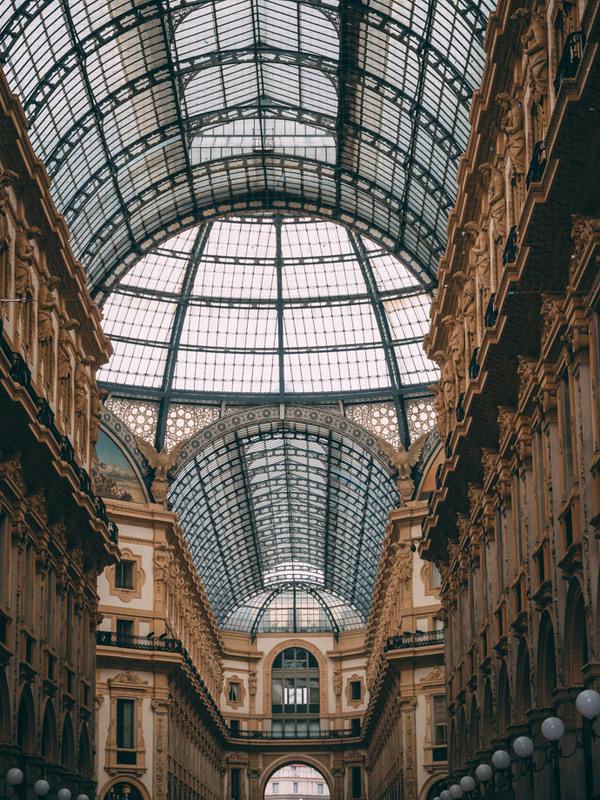 Whether you’re visiting Milan for the shopping or not, one absolutely beautiful structure you have to see is the Galleria Vittorio Emanuele II, right near the Duomo. 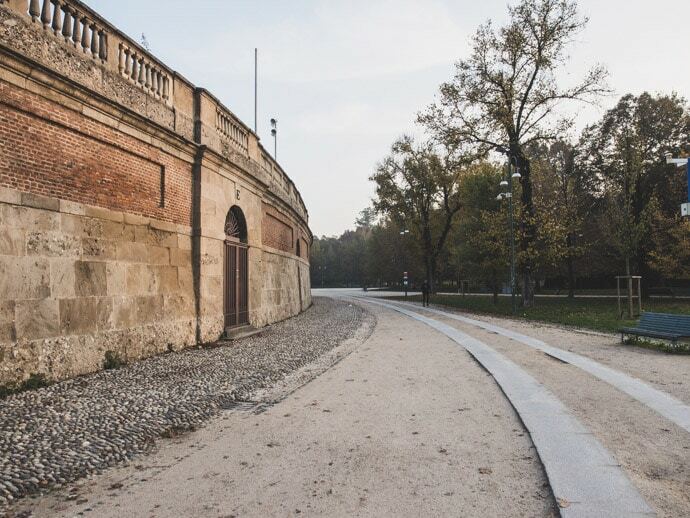 Two of my favourite things to do in Milan were walking through Parco Sempione and the Castello Sforzesco (Sforza Castle). The Brera District is one of my favourite Milan neighbourhoods to walk around. The streets are cobblestone with beautiful little shops, cafes and restaurants. 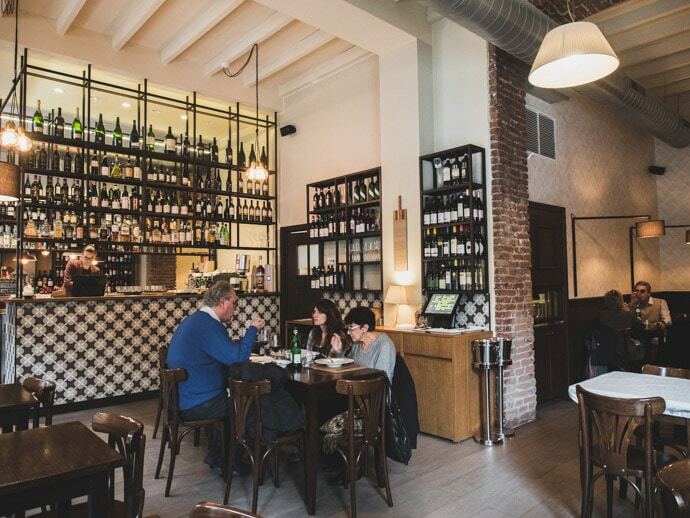 Another area worth a look is Via Paolo Sarpi in the 8th District. It is considered the centre of Milan’s Chinatown, although it is one of the more subdued Chinatowns I have seen. 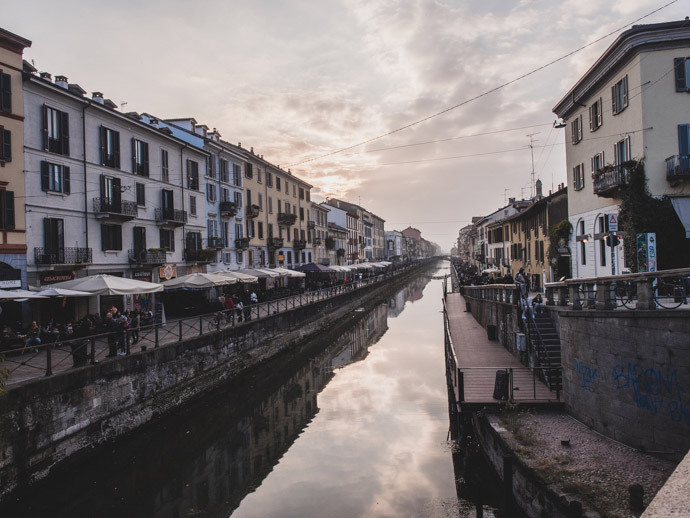 The Navigli district is another contrast again, with the Naviglio Grande Canal at its heart, lined with shops, restaurants and bars, buzzing with activity. 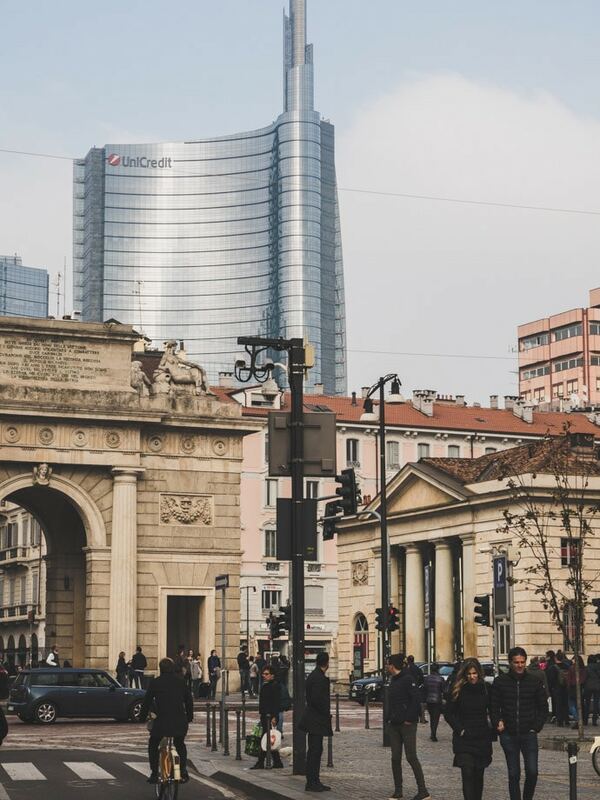 Porta Nuova district is the business district of Milan and unlike other areas in Milan, is filled with modern buildings and architecture. We walked past the Teatro alla Scala (Grand Opera House) but unfortunately are yet to go inside and see an Opera or Ballet. Milan is also a great place for the art appreciators. 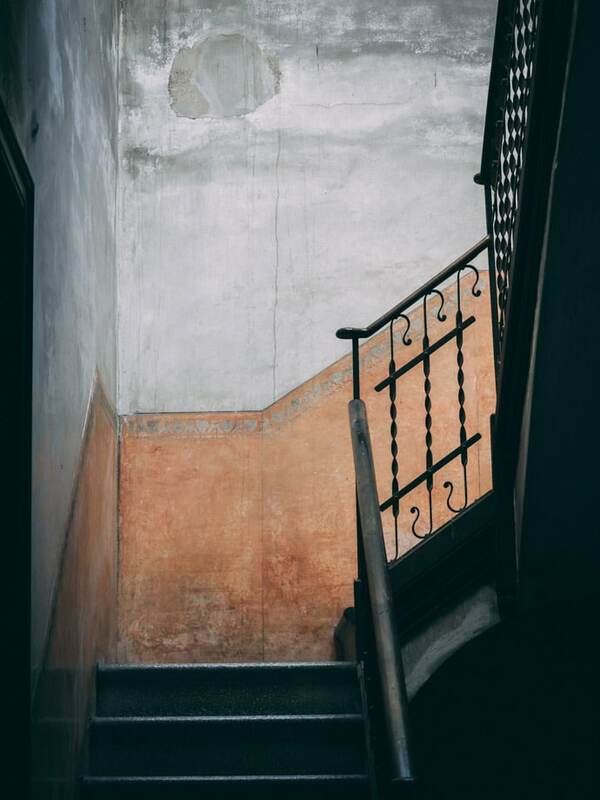 Pinacoteca di Brera is a beautiful art gallery in Milan. 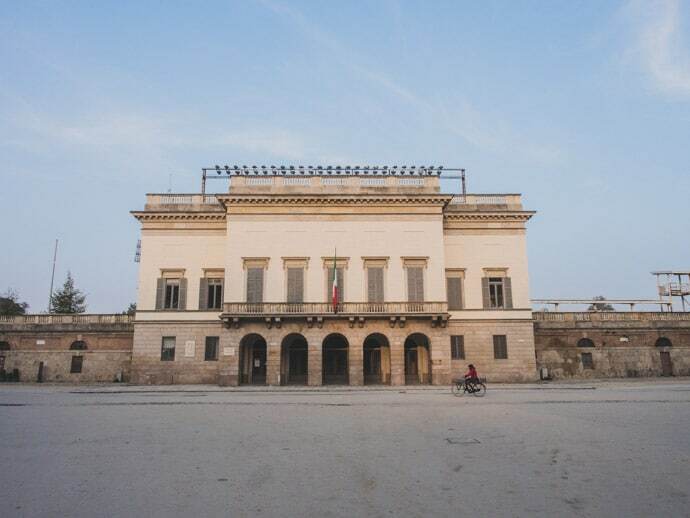 You can, of course, see Leonardo Di Vinci’s The Last Supper at the church of Santa Maria delle Grazie, but tickets can be difficult to get, so plan ahead. And for something a little more modern, you can try the Museo del Novecento, which also happens to have stunning views of the Duomo. When in Milan for the first time it’s inevitable that you will want to try some of their traditional dishes. 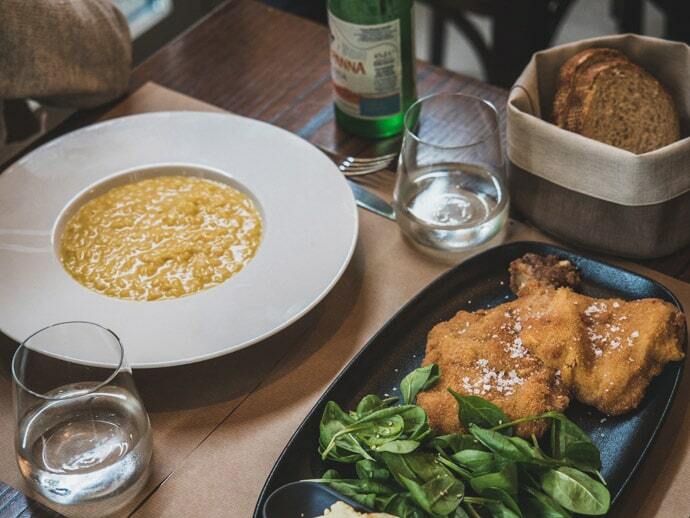 Osteria Brunello is a beautiful cosy restaurant and the perfect place to try two such dishes, Cotoletta (fried veal cutlet) and risotto alla Milanese (saffron risotto). 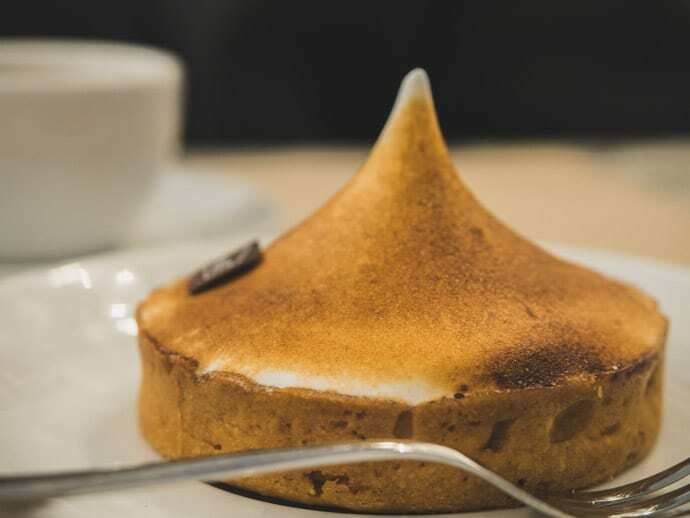 Pave Cafe is a lovely place for a casual lunch and dessert. We love the amatriciana sandwich (cheek lard, onions, pecorino cheese and oven baked tomato), lemon tart and espresso. 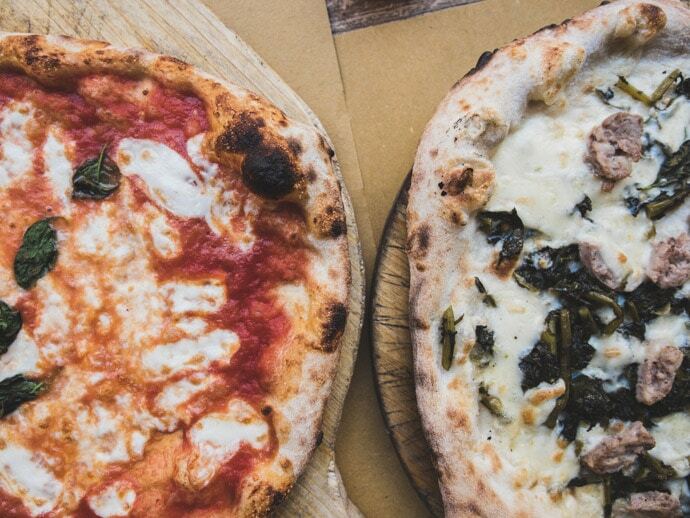 A great place for a casual pizza is Johnny Take Ue’. The pizza was delicious and the service was relaxed and super friendly. For a unique experience, get an espresso or snack from One Block Down, a beautifully designed shoe store with a cafe. For breakfast, lunch or an ‘any time of the day’ snack, Princi Bakery has a delicious array of sweet and savoury options. And when it comes to dessert in Italy, of course, Gelato is a must. 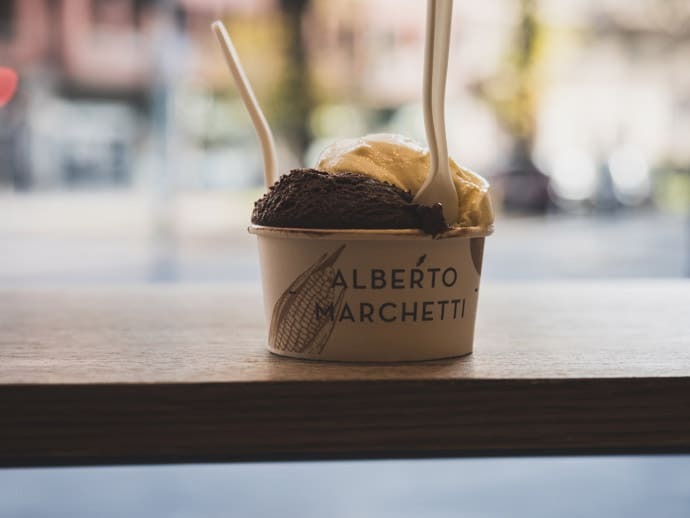 Alberto Marchetti is our favourite gelatos in Milan. 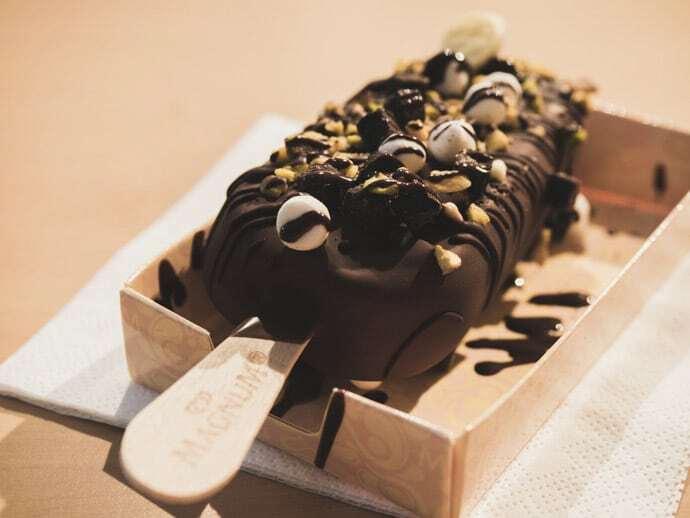 Another option is the Magnum Store where you can create your own Magnum. Bulgari Hotel Milano – beautifully designed 5-star hotel in an excellent location. Mandarin Oriental Milan – beautiful exterior and interior in the city centre. 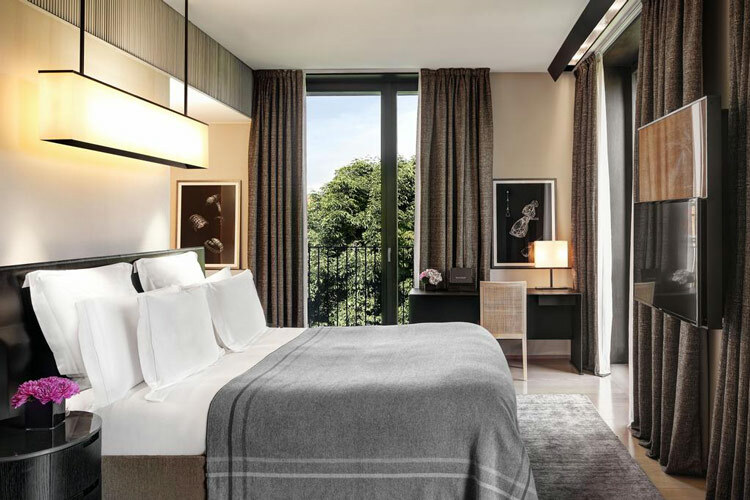 Park Hyatt Milan – a luxury hotel in an excellent location. Senato Hotel Milano – 4-star hotel in the city centre. 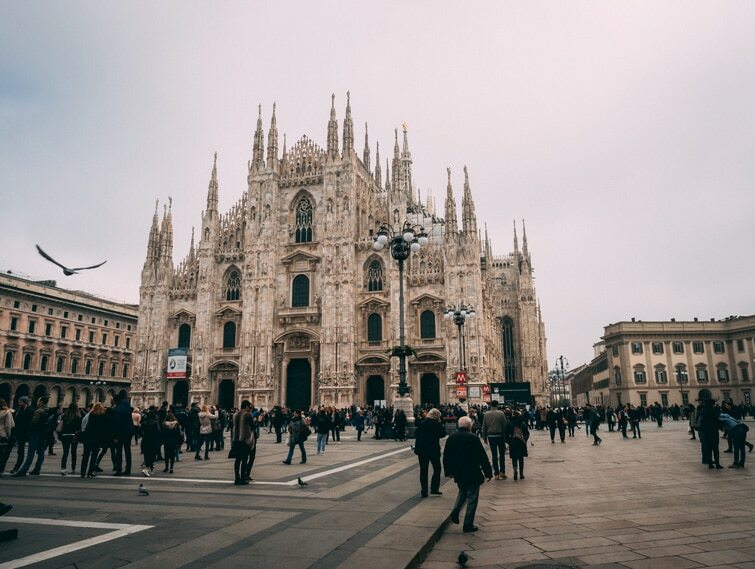 You can get to Milan via high-speed train from within Italy and many countries in Europe, or you can fly into its International airport (Milan Malpensa Airport). We love using the train where possible as you get to see so much of the in-between. 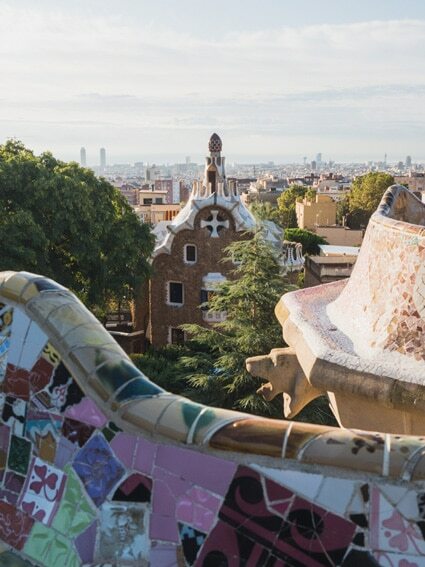 We book most of our Europe train tickets online through Trainline. 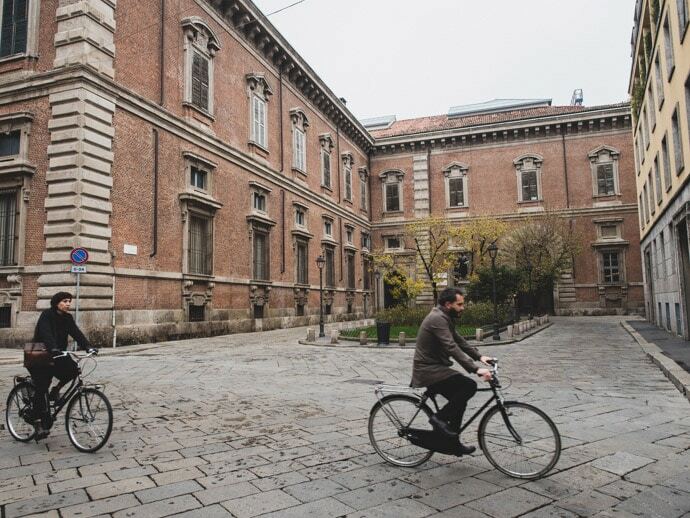 Of course, walking is our favourite way to get around Milan as it’s a very walkable city. Otherwise, there are trams, Metro and buses, and the same tickets can be used across all three modes of transport. You can also access Taxi’s and Uber in Milan. 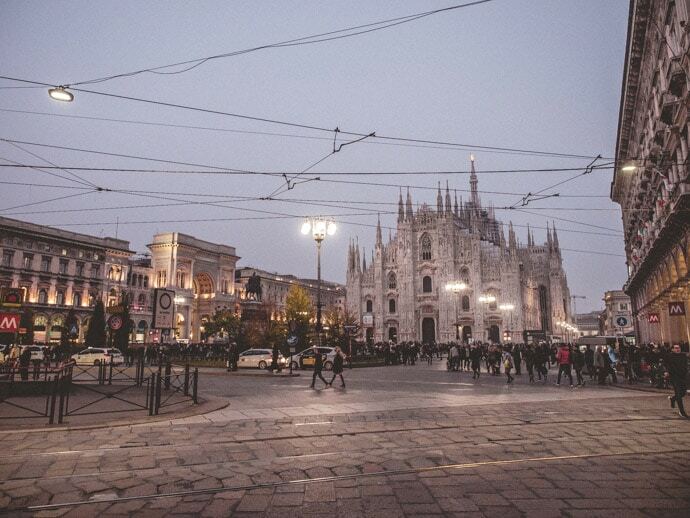 We visited Milan in late October, early November, which was chilly weather but still nice. Surprisingly, there were still a lot of tourists around. Obviously, Summer is your best bet for warm weather but keep in mind it is peak season. Autumn and Spring would be my pick for the best time to go to Milan. However, don’t expect there to be short lines just because of the shoulder season. 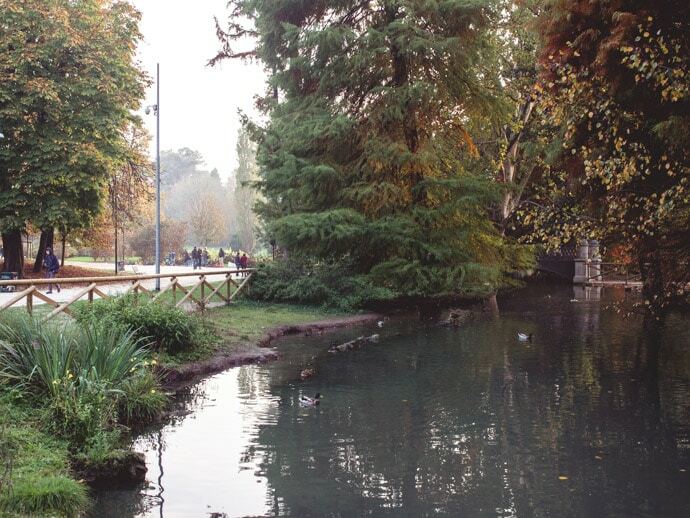 Milan is actually in a great location for some amazing day trips. Lake Como, Lake Maggiore and Lake Garda can both be reached by train from Milan within about an hour. The Città Alta (High City) of Bergamo is a medieval walled city also around an hour from Milan. Other places to consider are Cremona, Pavia, Parma, Bologna and Turin. How many days should you stay in Milan? 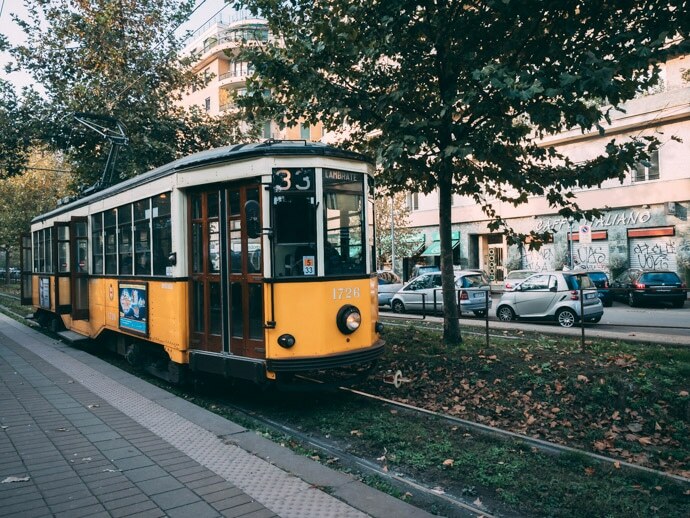 We visited Milan for 3 days and four nights and found this was enough time to see the main sights, explore and taste the food. I would recommend 2 nights as a minimum to see the main sights and 5 days to a week if you were intending on doing a couple of day trips to the surrounding areas. 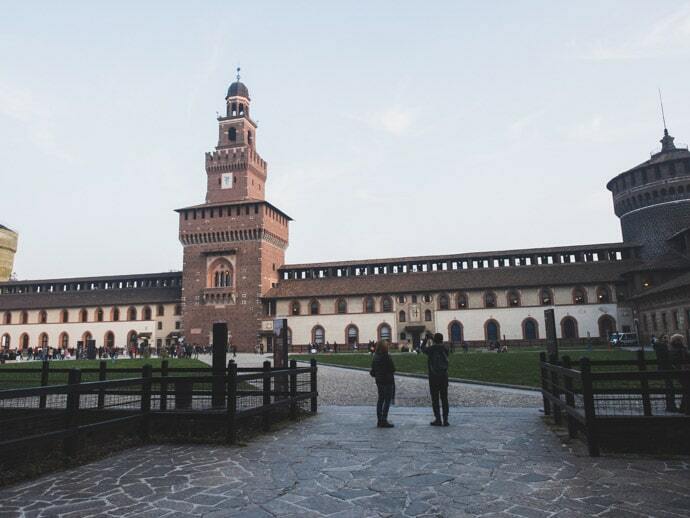 For more information visit the Milan tourism board. 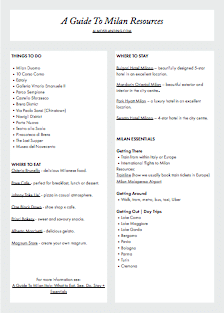 Get your free printable guide to Milan resources here.